It is now apparent that the “Maiden protests” in Kiev were in actuality a Washington organized coup against the elected democratic government. 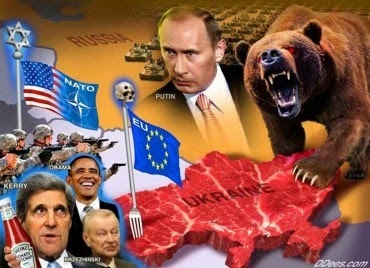 The purpose of the coup is to put NATO military bases on Ukraine’s border with Russia and to impose an IMF austerity program that serves as cover for Western financial interests to loot the country. The sincere idealistic protesters who took to the streets without being paid were the gullible dupes of the plot to destroy their country. Politically Ukraine is an untenable aggregation of Ukrainian and Russian territory, because traditional Russian territories were stuck into the borders of the Ukraine Soviet Republic by Lenin and Khrushchev. The Crimea, stuck into Ukraine by Khrushchev, has already departed and rejoined Russia. Unless some autonomy is granted to them, Russian areas in eastern and southern Ukraine might also depart and return to Russia. If the animosity displayed toward the Russian speaking population by the stooge government in Kiev continues, more defections to Russia are likely. The Washington-imposed coup faces other possible difficulties from what seems to be a growing conflict between the well-organized Right Sector and the Washington-imposed stooges. If armed conflict between these two groups were to occur, Washington might conclude that it needs to send help to its stooges. The appearance of US/NATO troops in Ukraine would create pressure on Putin to occupy the remaining Russian speaking parts of Ukraine. Before the political and geographical issues are settled, the Western looting of Ukraine has already begun. The Western media, doesn’t tell any more truth about IMF “rescue packages” than it does about anything else. The media reports, and many Ukrainians believe, that the IMF is going to rescue Ukraine financially by giving the country billions of dollars. Ukraine will never see one dollar of the IMF money. What the IMF is going to do is to substitute Ukrainian indebtedness to the IMF for Ukrainian indebtedness to Western banks. The IMF will hand over the money to the Western banks, and the Western banks will reduce Ukraine’s indebtedness by the amount of IMF money. Instead of being indebted to the banks, Ukraine will now be indebted to the IMF. Now the looting can begin. The IMF loan brings new conditions and imposes austerity on the Ukrainian people so that the Ukraine government can gather up the money with which to repay the IMF. The IMF conditions that will be imposed on the struggling Ukraine population will consist of severe reductions in old-age pensions, in government services, in government employment, and in subsidies for basic consumer purchases such as natural gas. Already low living standards will plummet. In addition, Ukrainian public assets and Ukrainian owned private industries will have to be sold off to Western purchasers. Additionally, Ukraine will have to float its currency. In a futile effort to protect its currency’s value from being driven very low (and consequently import prices very high) by speculators ganging up on the currency and short-selling it, Ukraine will borrow more money with which to support its currency in the foreign exchange market. Of course, the currency speculators will end up with the borrowed money, leaving Ukraine much deeper in debt than currently. The corruption involved is legendary, so the direct result of the gullible Maiden protesters will be lower Ukrainian living standards, more corruption, loss of sovereignty over the country’s economic policy, and the transfer of Ukrainian public and private property to Western interests. If Ukraine also falls into NATO’s clutches, Ukraine will also find itself in a military alliance against Russia and find itself targeted by Russian missiles. This will be a tragedy for Ukraine and Russia as Ukrainians have relatives in Russia and Russians have relatives in Ukraine. The two countries have essentially been one for 200 years. To have them torn apart by Western looting and Washington’s drive for world hegemony is a terrible shame and a great crime. The gullible dupes who participated in the orchestrated Maiden protests will rue it for the rest of their lives. One final word. Despite unequivocal evidence of one country after another being looted by the West, governments of indebted countries continue to sign up for IMF programs. Why do governments of countries continue to agree to the foreign looting of their populations? The only answer is that they are paid. The corruption that is descending upon Ukraine will make the former regime look honest. This article first appeared at Paul Craig Roberts’ website Institute For Political Economy. Paul Craig Roberts was Assistant Secretary of the Treasury for Economic Policy and associate editor of the Wall Street Journal. He was columnist for Business Week, Scripps Howard News Service, and Creators Syndicate. He has had many university appointments. His Internet columns have attracted a worldwide following.